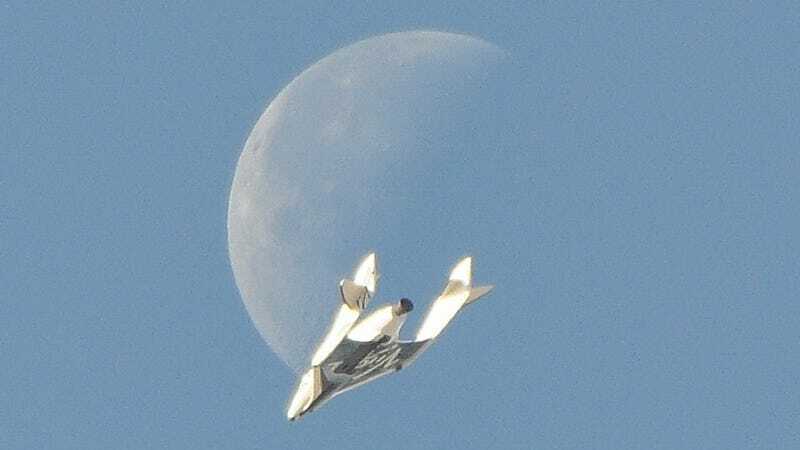 It looks way too good to be true, but this photo of Virgin Galactic's air-launched spaceplane is the real deal. The company has been conducting test flights (technically test glides – the ship has yet to be piloted with engines engaged) of its suborbital passenger ship SpaceShipTwo for close to two years now, and photos of the trial runs have been, generally speaking, pretty picturesque. But the photo up top, taken last week during SpaceShipTwo's 24th flawless drop test, puts every last one of them to shame. As Mokkari points out in the comments, it looks a lot like early NASA concept art. What a wonderful image. It looks like some NASA concept art from the late 70&apos;s.
"I used a Nikon D90 and Tamron 18-250 lens handheld - nothing fancy," said photographer Bill Deaver in an interview with SPACE.com's resident Insider Leonard David. "I've been trying to get that shot for some time and this morning the 'stars' lined up just right!" SpaceShipTwo is slated to begin powered flight tests later this year. Then again, Virgin Galactic said in 2011 that commercial flights would begin in 2012 – so we'll see what happens.